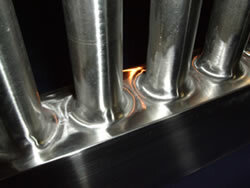 The surface finish of a part or assembly is often the first thing the customer notices. The finished product reflects the manufacturer's knowledge and understanding of finishing requirements. Supreme Manufacturing specializes in stainless steel craftsmanship. We excel where others merely promise. Supreme Manufacturing offers metal finishing that meets USDA, USDA Dairy, 3A, pharmaceutical, and mirror finishing requirements as low as 5 Ra. If these finishes are not required for your product, we also offer weld passivating with surf-ox technology.